You’re not a bad pet parent because you need to go to work – somebody’s got to pay for the kibble! But when you have a kitty or two sitting at home all day and you’re pretty sure your poor cats do nothing while you’re out besides nap – well let’s just say you’re amongst good company being concerned about feline boredom levels. I’m going to level with you. My husband and I both work from home and we still have issues keeping our house cat entertained. 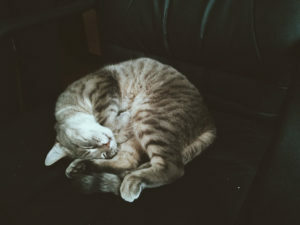 So while you may sometimes feel guilty about leaving your cat during work hours, don’t be too hard on yourself: cats are fickle creatures to keep entertained even if you’re around the house 24/7. That being said, there are plenty of things you can do to help cure the boredom bug. 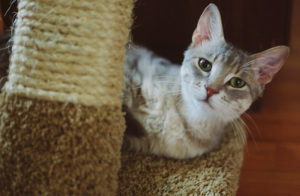 I’ve spoken a lot about the many ways you can decrease boredom for indoor cats here, so I’m not going to go into full detail about the general ways to reduce cat boredom in this article. 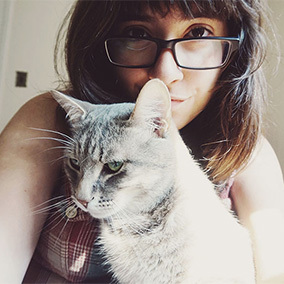 This particular post is meant to concentrate on the specific cat toys you can buy that cats are able to play with by themselves, and thus, toys that would be ideal and likely your best bet to leave out for cats that are home alone for a number of hours during the day. Obviously, we all know cats, and so just because a toy is available to them, doesn’t mean they’ll use it. At the same time, I don’t think it ever hurts to have variety and options scattered around your home, just in case kitty gets that mythical burst of hunter energy and wants to release it by swatting or even kicking a toy nearby, but mum or dad doesn’t happen to be around to play with. If you know of any cat toys that work perfectly as home alone/play-by-themselves types, please recommend them in the comments down below! Since I find these types of toys so helpful to have around myself, I’ve been doing my best to continuously update this list when I spot more toys that work really well for this purpose. A lot of the cat toys I’ll be talking about in this list are little items a cat can bat around, and those are often included in bundles/variety packs like these. From balls to small mice to swat at, if a kitty’s looking for a victim to take out its energy on, you’d better believe it’d be handy to have some toys like these around. Of course, when you are home, you can always help kitty out by throwing a toy or two like these across hallways to make the toys much more interesting “moving” targets. But that doesn’t stop these toys from being interesting enough prey when you’re away from the house. Looking for more variety packs to jump-start your cat toy options? Try the Friends Forever Variety Pack, Youngever 20 Cat Toys Assortment (which comes with a cat tunnel! ), the HARTZ Just For Cats Toy 13 Piece Variety Pack, or the HDP 20 Piece Assorted Cat Toy Grab Bag. A cross between a cat toy and cat furniture, this Ripple Rug is all the rage right now. Reading reports from pet parents watching their cats become obsessed with this thing before it’s even finished being unpacked, and watching their kitties drag their toys to hide in this rug creating a stash of sorts makes me so jealous. I want one of these, but it’s not an easy cat toy to find in the UK yet. Been watching for it to pop up over here like a hawk, as it’s probably the most promising new thing for cats on the market right now. Certainly one I’m hoping will pique the interest of my lazy kitty! Looking for more cat furniture/cat toy hybrids? There’s the popular and yet incredibly inexpensive cat tunnel, and while doing a little digging for my article on cat trees with leaves on them, I actually found one more: this On2Pets CatHaven Cat Condo, which I think any cat would love to peek out of and grab a slew of cat toys from behind. I keep recommending these, but that’s because they’re quite frankly so cheap and were for a solid year so well loved by my cat, I can’t help placing them in the top 3 of quite a few cat toy round ups. Cat springs are of the only toys my lazy Avery has ever played with by himself, and probably the only store-bought toy he has used on his own if my memory serves right. They’re one of the only home-alone cat toys that are so high-energy they made it onto my list of cat exercise toys ideal for keeping a feline fit, and work perfectly either as home alone cat toys or as toys you can pick up and throw to engage your pet with yourself when you have a spare moment in the day. They’re so cheap and affordable, it doesn’t matter if you loose a hundred of them under the furniture, and are available in enough size & texture varieties (Categories Catty Coil Springs & Spot Ethical Pet Thin Springs to name a few), you could easily keep your cat entertained with cat springs alone if that’s the only thing he or she liked. These a smash hit with your cat? Looking for something similar-yet-different? Check out Spot Fun Tubes, Petmate Cat Crazies, Petstages Night Time Catnip Rolls, and Petmate Loony Loops. This toy has ridiculously high reviews, but Avery has never once in his adult life touched a ball – let alone a ball on a track. He used to play with the Catit Senses Play Circuit when he was a kitten, and it’s sort of in the same vein as this, but even then it didn’t hold his attention for long. I have to list this item high up on this list, however, considering everybody else’s cat seems to like it (at least it feels that way!). Too bad this is an almost certain no-go with my Avery! Quite a few cats go gaga for catnip, and there’s no better way to take advantage than with one of the many catnip toys on the market. It’s, in my opinion, a good idea to hide these whenever you get home, and pull them out during the day, right before you leave for work or any sort of outing. Cats do really seem to like change in their environment, and love toys more when they are gone long enough to miss them. If your cat’s the type to go crazy for catnip, rotating through a different catnip toy each day of the week, or from one week to the next, might just be enough to keep an indoor kitty home alone entertained in your absence. Obsessed with adorable catnip toys like me? 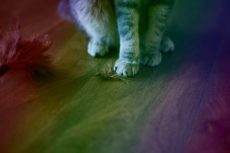 Check out what I think are some of the cutest catnip toys around here. A yank-on-a-string cat toy is, in my opinion, one of the most unique types of toys you get for cats to play with by themselves when home alone. Hanging one on a doorknob is easy enough, and if your cat is anything like mine and loves to jump, it seems like the ideal way to get some energy out. I really need to grab one to try out with Avery! 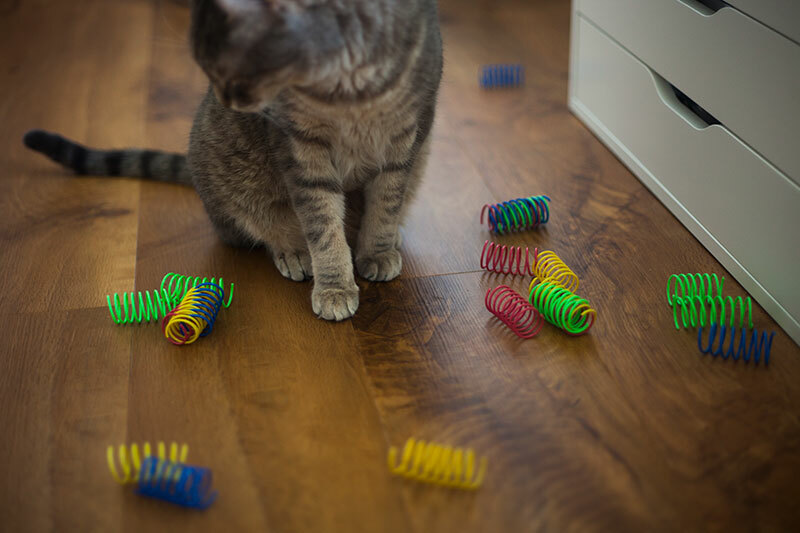 A word of caution about these cat toys; be sure to watch and see if your cat is aggressive with them, if he or she bites the string, and/or yanks very hard and thus may be able to manage to yank off or tear apart the string. If you have a cat who plays rough with one of these, they may prove to be a choking hazard to your pet if used unattended. Thus, I’d advise only pulling them out when you’re home if your cat really likes them but beats them up quite a bit. Cat digging yank-on-a-string toys? You might also want to try the automatic battery operated variety of this pull-on-a-string toy: Moody Pet’s Fling-AMA-String. It has really high reviews, and looks incredibly engaging for even hard-to-please cats. 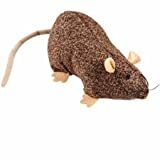 There are also a couple other non-battery operated types you can buy as alternatives to the JW Pet Company one as well: Our Pets’ Play-N-Squeak Batting Practice and Ethical Pet’s A-Door-Able Bouncing Mouse. Yet another not-quite-a-toy item on this list, but this time, unlike the furniture/toy hybrid Ripple Rug from spot #2, we have a cross between a pet feeder and a cat toy. I love using feeder toys as methods of distraction when leaving pets home alone. No more surefire way to keep my food-loving cat entertained in my absence than filling one of these. I recommend the Catit Senses Food Tree a lot on this blog, but that’s just because I absolutely love it and have been using it for years. In case you’re curious about the ins and outs of why, you can check out my review of it here. That being said, it’s definitely not the only wonderfully entertaining feeding toy around and may not even be the top pick for you. 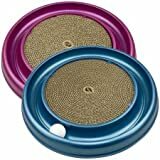 My mom, for instance, preferred the Petsafe Slimcat ball feeder to entertain her cat in the evenings, and I actually used to use this toy a lot in the past, leaving it out whenever I left the house; though always in conjunction with the Catit Food Maze, which I simply used to use for meals. You definitely don’t have to settle on one feeding toy, especially if you have a picky cat, who like mine, usually needs a little bribing to get to engage with a toy. 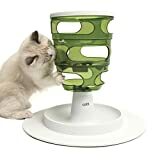 Some more alternatives to the Catit Food Tree feeding toy that are popular include: Catit Hagen Treat Ball, KONG Cat Wobbler, PetSafe FUNKitty Egg Cersizer, KONG Active Treat Ball. I’ll do my best to get out a full article on feeding toy options, but if you’re looking for the most fun/entertaining options for cats, definitely treat ball types like these or the food maze puzzle types are the way to go. Cat Dancer’s got an excellent reputation for managing to come up with extremely affordable cat toys that are somehow so ridiculously engaging to cats they beat out toys worth 3-4 times their price. 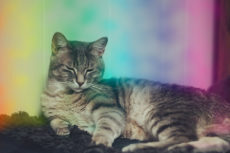 While not every cat will give toys like their Rainbow Cat Charmer a go, the ones that do seem to go crazy for them, and since – again – they’re so affordable it’s hard to find a company with a better track record in their low price bracket. These Dancer Chasers are yet another crazy-cheap product. They’re interesting looking card twisted cardboard (of the sort Cat Dancer is known for) and rainbow fleece (looks like the same material as their Rainbow Charmer), that are designed for cats to play with by themselves: batting, chasing, and pouncing endlessly on repeat. And while they seem to have just come out and thus don’t have many reviews, my guess is they may just be the next big success story from an already successful cat toy company. Catit has a few Eco Terra natural corn husk and raffia products that I would think any cat who’s into the Cat Dancer Chasers (swat + crinkle!) may also be into. These include: the Cat Toy Ring, the Ball with String, and the Cornhusk and Raffia Mice. Obviously, balls are one of the first ideas that likely comes to mind when you think of toys that are perfect for cats who are spending some time at home alone. But while bouncy balls like these may be the first toy balls that come to mind, I find they don’t always do the trick getting a cat’s attention like other balls do. These crinkle balls are indubitably up a lot more cats’ allies, but if you haven’t tried either, it’s a good idea to get a few of each. My mum’s cat, Walker, absolutely adores his bouncy balls and will even pick them out of his toy basket to play with by himself; so you should never rule them out until you’ve tried! Looking for more toy balls to try? There are actually a lot more varieties of the common toy made specifically for cats than you might think. 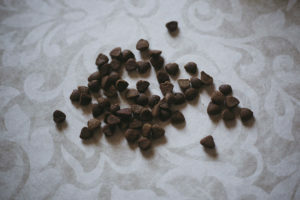 Check out this article for a cat toy ball round up. I once house-sat for a friend whose cat, Weiss, was obsessed with this toy. It’s got a slew of amazing reviews on Amazon, but I can’t help but think Avery wouldn’t take a second look at the thing. That being said, it’s a scratcher and and a track toy in one, and my boy does really love his scratchers, so sometimes I think I should just give this toy a proper shot by grabbing one and testing, especially since it has so many positive reviews and has been around for quite a long enough time to gather negative reviews if it warranted it. 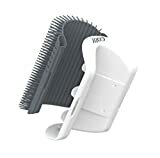 You can even buy replacement pads, a grooming arch, different balls, cat grass as a replacement for the scratcher, and a few other accessories to enhance the toy if your cat happens to like it. So honestly, I think I may have been a bit too hasty in passing up on this one. Of course toy mice had to be included in this list. 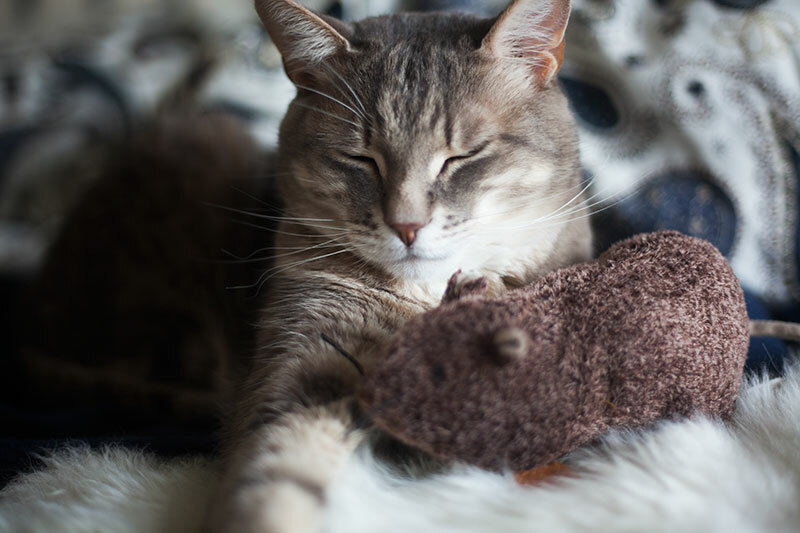 The sheer variety in the amount of toy mice available for cats is insane, so if your cat loves these, my advice to you is to grab them in a number of different textures, sizes, and styles: some with feather tails or made of sisal rope, some fuzzy, some furry, some small – you get the idea! This toy mouse in particular goes high up on the list to try if you’ve got a particularly hard to engage, lazy cat like my own. Why? 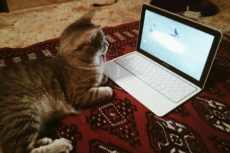 It makes electronic squeak sounds when it’s poked and prodded, so it’s way more likely to keep your cat’s attention when he or she wants to play. Tried out a toy like this before? Found it was a hit? 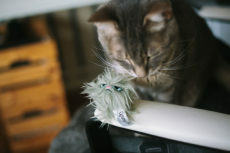 Check out some more cat toys that make electronic sounds like squeaks and chirps – the vast majority of them are home alone friendly, which is awesome. I mentioned cats kicking toys briefly in the introduction, and while my own cat has always been a huge fan of kicking, he’s never played with a kick toy on his own before. That being said, there’s no particular reason he shouldn’t, but my Avery’s a particularly fickle fella when it comes to play time, and I’m somehow convinced he thinks if he starts playing by himself, I won’t be playing with him as much anymore. He loves this particular kick toy when we play together, and so I feel it’d be the kind of thing other, more playful cats wouldn’t mind playing with on their own. Especially considering it can be stuffed with fresh catnip (has a velcro pouch so you can continuously replace and refill) so for cats that react to catnip, it’d be a pretty sure bet. Check out my review if you’re interested, and take a peek at this article for other cat kick toy ideas. 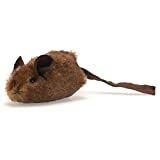 If your cat’s at all into chewing and gnawing, you may want to try having a few different cat chew toys like these around the house for him or her to play with. While most of the time, teething kittens will grow out of their urge to chew, some cats never do, and continue to love the sensation of biting throughout their entire lives. Thus, these toys don’t just make for excellent kitten toys – they can often be perfect for adult cats as well. 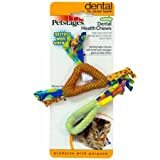 Besides these dental health chew toys, other great chew toys by Petstages include: Catnip Chew Mice, Tons of Tails, and Plaque Away Dental Pretzel. The KONG Cat Hubba Wubba is also supposed to be really good, and is more or less a stuffed toy/cat chew toy hybrid, which is an excellent combination for a home alone cat toy. Cat digging chew toys? Want some more options for variety? Check out my list of the best cat chew toys here. My brother’s cat, Beau, was obsessed with this toy when I bought it for Avery and Avery passed it up. What is it? 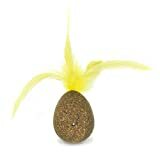 A cork egg made out of compressed catnip and cork that makes an electronic mouse squeak when your pet pokes at it and kicks it. The older version, the one I bought Avery and ended up giving to Beau, didn’t have the feathers sticking out, so I think this version is probably a lot more enticing. It’s definitely something I’d try buying again, especially since it’s such a durable toy and quite frankly should be engaging considering the realistic squeak sound and the way it rolls around. Perfect toy to have around the house for your cat to swat at, whether your cat is home alone or not. 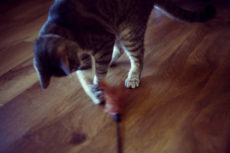 If you find your cat really goes for feather toys, by the way, you might want to check out my round up of all the different types of feather toys I could find. I find it’s usually best to try variations of the cat toys you already know your cat likes. Makes looking for toys easier for you, and makes whatever you grab more likely to be a big hit. I’ve spoken about the Original Cat Dancer 101 in many different articles on this site before – why? It’s probably one of the cheapest cat toys around that’s still ridiculously good at engaging hard-to-get-to-play cats, and that’s an enormous feat for a cat toy considering the vast majority are completely ignored by our furry friends. Now, the Original Cat Dancer is not at all a home alone cat toy, cats definitely can’t play with them without human intervention, but it seems this new “Deluxe” version remedies that with a really simple wall-mount plastic holder that sticks onto surfaces with a mild sticker adhesive. I’m sure that it doesn’t stick to the wall very well, but that’s not what’s important, because realistically, if your cat loved this toy enough, you could find a piece of furniture you didn’t mind ruining a bit, hot glue this plastic piece onto it, and continue to replace the only part that actually breaks (the Original Cat Dancer toy) for a pretty darn affordable price. Yes, this toy is similar in concept to the yank-on-a-string cat toys from #6, but it’s not quite the same since apparently the way the metal stringy bit moves is more like a flying insect like a moth or a June bug. Pretty cool if you ask me. Cat toy boxes are a perfect place to stuff a variety of the little swat-able toys for cats you have around the house to make them a little more enticing for a kitty. Makes toys like springs, balls, rope toy mice, and small stuffed catnip toys into a game where your cat has to dig and pull to get them out. Thus it’s a different sort of activity, keeping things fresh and giving some more variety in the type of play your cat might want to engage in. Want to make it more likely your cat will engage with one of these? Try placing kibble inside for your cat to pull out of the many holes – it’s one of the only surefire way for me to get Avery to interact! Having a slew of toys cats can play with by themselves isn’t the only way you can keep an indoor cat entertained in your absence. 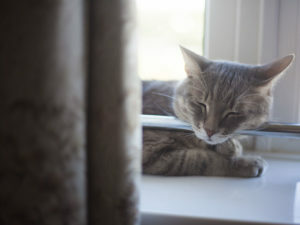 You could try setting a timed automatic pet feeder to delve out food at regular intervals throughout times you’re away – to help your cat wake up, stretch, and have a stroll around the house and increase the chances he or she will actively engage with the toys you’ve left out for him or her. 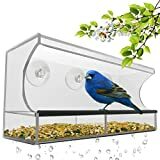 You can place suction cup bird feeders outside your window and keep them topped up with bird food to make sure your cat has plenty to watch in mornings, or even grab a closed off fish tank so your cat has some fishies to watch throughout the entire day. 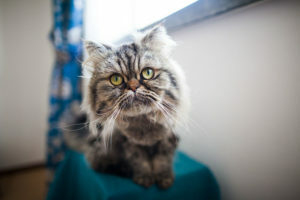 Some cats like it when you leave the radio on for them during the day – to a talk show or a music channel, and many appreciate self-groomers and grooming arches they can give themselves massages with, even when you are home. 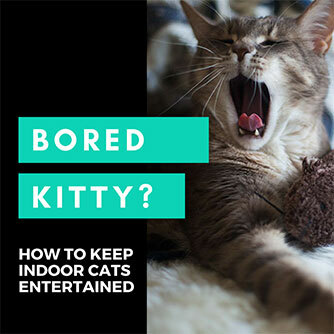 If you’re interested in reading more tips like these for check out my article on keeping bored indoor cats passively entertained. Cat Toys You Would Recommend Leaving Out When Cats Are Home Alone? What cat toys would you recommend leaving out for kitties who have to be left alone for a few hours in the day? Is there a cat toy your cat loves playing with by him or herself? Is there a type of toy your cat would never touch no matter what? Do you leave out specific cat toys when you’re at work or out and about? Do you rotate through or hide any of these toys when you come back home? Let me know what works for your cat in the comments section down below! We have three cats with all differing personalities. Two 2 year olds and one 16 years old. I am always searching for new toys. We have many on them mentioned. One thing we do is buy a roll of brown package paper that we crickle and put in a corner. All of our cats love it regularly. Might mean daily to ever couple days. It us both a scent soaker and adventure. We do move it a couple times and change the paper every three to four weeks. Another toy our cats like is bouncy tails great fun. Usually we start the action with a throw. The feather I think brings out the hunting instincts. That’s genius. Avery loves the sound and feel of brown package paper, I should definitely try this. I’ve yet to try bouncy tails – need to give those a go! Thank you so much for the recommendations! THANK YOU for recommending the Mouse Hunter toy! I purchased one out of desperation to keep my Luther stimulated (he’s a rescue who’s spent the majority of his life on the streets, so I have some pretty big shoes to fill), and he fell in LOVE from the first squeak! As I type this, he’s gearing up for a nice long sleep, which means my feet will live another day! Absolutely! My Avery is a stray we found in our neighbourhood and has never been easy to engage in play. The second I got a squeaker toy that looked almost exactly like the Mouse Hunter, he went crazy and played on his own for once in his life, so I knew I had to share for others with the same troubles! Let me know if you try out any more electronic sound cat toys (I’ve made a list of a bunch of options here for my own reference, but haven’t yet bought more for Avery to try – working on it!). If your cat also likes a few more of this type of toy, my guess is Avery will, too. I’m hoping this is a trend and anything with a electronic squeak/chirp will make Avery more likely to play, but only one way to find out, really! Thanks so much for the tips! I recently got a new kitten named Zepplin. Yes after Led Zepplin. Its been a while since I had a cat. I’ve been looking for ways to keep him entertained while I’m at my college classes. We have no problem playing with each other. I just want to make sure I can keep him stimulated when I’m not able to myself. Wow, yet another vote for Neko Flies!! Really need to grab one of these, then! Athena hates to play by herself so I try my best to play with her every day. As I work from home we manage a few short bursts of playtime each day. Avery is like this. Few short bursts of playtime each day are what I have to do, too. But thankfully, on the things-he-might-actually-play-with-by-himself front, I had a bit of luck with the Frolicat Bolt – the automatic laser toy. Obviously they’re not toys you can leave with a kitty that’s home alone, but still pretty good in terms of options, for days I just can’t get him to engage with other toys myself. I do tend to save things like that for desperate times, so far so good! Would love to know which toys Athena likes best, as if she’s fickle like Avery about playtime, maybe he shares the same taste in cat toys she does? 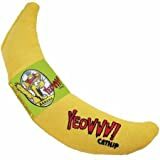 We have had the Yeoww banana catnip which is popular. The crinkle type balls also are carried around. I have had compressed catnip balls–not with a feather like the one you show–and they were not interested in them. The feather might make the difference. My cats never had any interest no matter what I did in the Peek a Prize toybox. It is wooden and the only thing it is good for is for me to trip over! 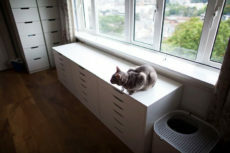 I think young kittens would be interested in it, but adult cats not so much! On the inexpensive side–the cardboard tube in the middle of a paper towel roll is great fun for scratching and rabbit kicking. Drat about the Peek a Prize Toybox. I had a DIY version of this type of thing and Avery used it avidly – when we’d put kibble in it, haha. So I think I could get him to use that one in the same way, but definitely without kibble I don’t think he’d be the slightest bit interested. I feel like I’m doing the toilet paper roll DIYs wrong or something, Avery is not taking to them at all when I do them. Maybe I’m just not good at engaging him or showing him how to play with them or something, though. Sometimes I feel like I need a second cat to just show him how to behave and engage like a cat. He’s so silly about not understanding how specific toys can be fun! We love Neko Flies, but they CANNOT be left out without a human around. We purchased a turbo scratcher, and Da Boyz love it, but the older cats ignore it. Great post! This is legitimately the first time I’ve heard of the Neko Flies, so thank you for the recommendation! Definitely always looking for toys I can play with Avery with, not just toys he can play with by himself, so I’ll do my best to get a hold of one of these to try! 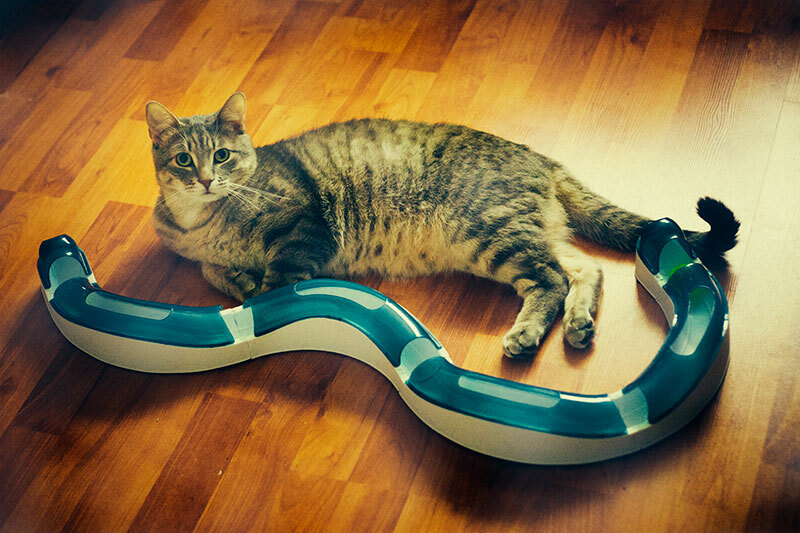 Okay so maybe the Turbo Scratcher is more of a kitten/young cat toy? I feel like Avery was a grumpy old man from birth; that would make sense of things, haha. What are the older cats into?